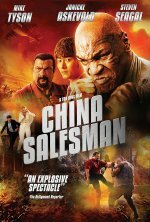 China Salesman release date was Monday, June 18, 2018. This was a Limited in theaters release. Based on a true story, China Salesman takes us on a dangerous and epic adventure to Africa where a Chinese engineer/salesman comes face-to-face with a corrupt competitor over the contract for the first mobile telecom technology in Africa. Local tribesman Kabbah (Mike Tyson) and mercenary Lauder (Steven Seagal) get drawn into the conflict in a classic, brutal hand-to-hand fight while the entire country faces civil war battles.